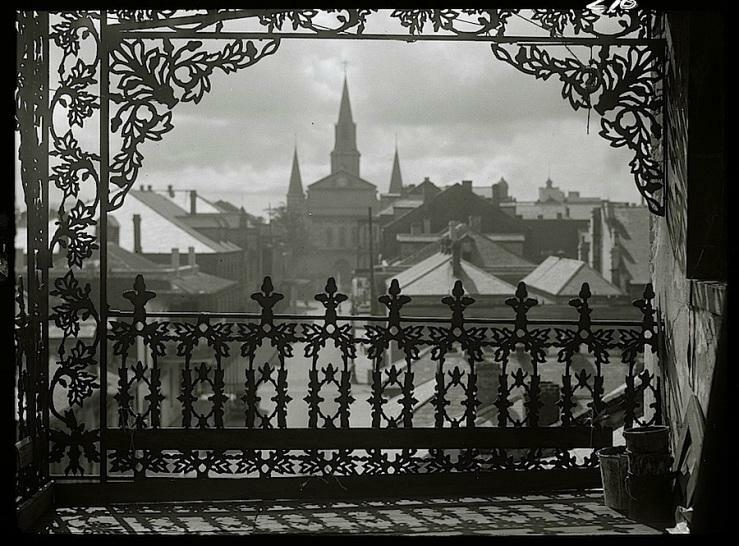 “A vista through iron lace, New Orleans,” ca. 1920-26, by Arnold Genthe, via Library of Congress Prints and Photographs Division. Set forth below is the twenty-ninth “Texas Shout” column. It first appeared in the June 1992 issue of the West Coast Rag, (now Syncopated Times.) As I have mentioned in a previous introduction to a TAR “Texas Shout” reprint, I now use the term”jazz time” in my Road Scholar course to refer to the unique rhythmic characteristic of jazz that is more commonly described (as in the following article) as ‘hot” and “swinging”. Not long ago, I was having dinner at a festival with another bandleader. I said something about leaders being on the lookout for good tunes to play. My friend’s response caught me off guard. Personally, I am a bandleader who pays a lot of attention to repertoire. Not having given the subject all that much thought, I assumed that other bandleaders also spent some time in selecting material for their combos to learn and that, in connection with this activity, they would have a heightened sense of awareness with respect to locating the best jazz vehicles. However, having a lot of respect for my friend as a bandleader and Dixieland musician, I tried to put myself in his position. I realized that, if you look at our music from a certain viewpoint, his remarks made a lot of sense. If music isn’t hot or doesn’t swing, in the senses just mentioned, then it isn’t jazz. Note that “swinging” and “playing hot” doesn’t mean music that is fast and loud — it means music played with the type of beat and feeling described above, whether fast or slow, loud or soft, restrained or boisterous. Moreover, you can’t have too much swing and heat. The more you have, the jazzier a performance will be. Further, if you want your performance to be judged as jazz, you must recognize that there is no substitute for swing and heat. You can’t make up for the lack of swing and heat via a well-organized presentation. You can’t compensate for that lack via clean execution, pure tone, or any other technical accomplishment. You can’t gain points over jazzier bands by one-upping them on repertoire. Put another way, a hot, swinging performance of the most overplayed Dixieland tune in the world (whatever that may be) is more successful as jazz, more deserving of the attention of jazz fans, than a slightly less hot, slightly less swinging performance of the least-heard selection that can be unearthed. I have a lot of tolerance (even preference) for diversity in the jazz community, but in this instance I would go so far as to say that any person who has trouble accepting the truth of the preceding statement does not fully understand what makes jazz the unique music that it is. Now let’s go back to my dinner table conversation. What my friend was saying, I think, is that he, like any seasoned Dixieland musician, has become familiar over the years with dozens, hundreds, perhaps thousands, of tunes which, in the hands of a musician who knows how to play Dixieland, can, without much trouble, be made to swing with heat. Because swinging with heat is the heart and soul of playing our music, he can call up any of these titles with a basis for believing that the resulting performance will pass muster as jazz. That is a perfectly valid way to look at programming. Many bands do quite well by operating in such a manner, providing sound, worthwhile (and sometimes much better) jazz for their fans. I’m not saying that leaders shouldn’t seek out worthy but neglected material for their sidemen. There is a decided value in doing so. Because I put a high value on exposing audiences to the almost limitless breadth of Dixieland jazz, finding under­played quality material is an activity that occupies a significant portion of my own bandleading agenda. I am simply saying that, if you and your sidemen know how to play Dixieland properly, you can get the job done without doing so if that is your wont. However, all bandleaders do, by some process, choose a repertoire for their combos, even if that process involves a spur-of-the-moment onstage inspiration as to what the next tune ought to be. The foregoing points suggest to me a simple practice to be followed in the tune selection process, perhaps an obvious one, but one that seems to me to be overlooked more than it should be. Namely, keeping in mind the abilities of his sidemen, and of his ensemble col­lectively, a leader should not decide to present a tune to his audience, either live or on record, unless he has a high degree of confidence that his band will be able to deliver a rendition of it that swings with heat — at least, not if he wants the performance to be regarded as jazz. I can understand why a band may particularly wish to show the audience the difficult arrangement it has mastered. Similarly, no one knows better than I the joys of exposing the crowd to a quality tune that will be new to most of the listeners. However, if a rendition isn’t going to be hot and swinging, a band shouldn’t be surprised if the knowledgeable jazz fans, the peers that it may want to impress the most, are somewhat turned off by its version and say, as my good friend Anna Wahler occasionally would, that the ride is STAD (see WCR’s “Letter Drop” column of April 1991 for a full translation of this unfavorable assessment). In addition to being a fine musician (and teacher of jazz), Bill is a most articulate person, fully capable of speaking for himself. I do not purport in any way to be putting words in Bill’s mouth, but I would like to speculate a bit about exactly what he meant by the above-quoted sentence. I don’t hear him saying that the notes and melodic lines which the musicians have to play to execute “Wrought Iron Rag” are particularly difficult — certainly not for a septet that has the QCJB’s musicianship. “Wrought Iron Rag” does not call for any instrument to move outside of its normal range, or in exceptionally dense flurries, or with unusual leaps and twists. What I think Bill meant was that, looked at from the viewpoint of a Dixieland jazzman, “Wrought Iron Rag” is put together in a fashion that Dixielanders do not find comfortable. Said another way, the hardest assignment in the world for a Dixielander may be getting “Wrought Iron Rag” to swing with heat. If so, I see exactly where he’s coming from. I have heard many recordings of “Wrought Iron Rag,” quite a few of them by highly-regarded combos, including De Paris’ own. As best I can recall, the tune has, to a greater or lesser degree, defeated all comers with respect to (what I assume is) their goal of creating a successful jazz rendition. Although I have never bothered to learn “Wrought Iron Rag,” I have played along with records of it on many occasions. It is a long, extremely complex piece with roadblocks in virtually every bar — that is, the musician is constantly encountering melodies that don’t go where normal Dixieland melodies go, harmonies that don’t progress as do typical Dixieland tunes, sudden tempo changes in unexpected places, and passages that call for tight, intricate voicing instead of the familiar Dixieland polyphony. As a result, the artist never gets to relax and concentrate on the thing he’s supposed to be doing — playing hot and swinging. Consequently, the rendition, at some point (and maybe several), fails to swing with heat and loses some of its jazziness. I do not denigrate distinctive melodies, novel harmonies and creative routines. Quite the contrary; I avidly seek them out. However, like everything else, these virtues have their limitations as well. When those limitations are exceeded, as I think they are in “Wrought Iron Rag,” they become crippling handicaps. Personally, I have been ready for years to see the jazz community give up trying to overcome “Wrought Iron Rag.” I believe it is a thoroughly misconceived, unplayable (as jazz) monstrosity that should be consigned to the scrap heap. However, I know there are readers out there who’ve enjoyed hearing “Wrought Iron Rag.” Fine — I’m happy to see them having a good time. I can also understand why bands keep launching kamikaze assaults on this tune, just as Sir Edmund Hilary insisted on trying to scale un­climbable heights, just because they were there. My point is, if you want to woodshed a piece as a way of disciplining and challenging your band, great. If you want to include it in your show to demonstrate to us all that you can negotiate it without any obvious clams, no problem. However, if you can’t get it to swing with heat, don’t expect to be given passing grades on the jazz scale. I have picked on “Wrought Iron Rag” partly because Bill’s “hardest tune …” comment suggested to me that another informed writer may share my view of the problems it poses opposite swinging with heat. If I’ve misrepresented Bill, I apologize. And his album is a good one, anyway. But the larger point is valid, I think. If your band hasn’t reached the stage where it can get, say, multi-theme pieces off the ground, leave them out of your show and records until it does. After all, many combos (particularly ones who play strict up­town New Orleans style) create wonderful jazz using not much more than a repertoire of one-strain tunes with spare melodies and common chord patterns, played in standard keys. Loads of blues singers in the twenties created bodies of recordings — performances now venerated around the world — built on not much more than one 12-bar blues foundation with little or no variation from tune to tune in melody, harmony or even key. Re­member, it don’t mean a thing to jazz fans, not a thing, if it ain’t got that swing. Having said that, I should emphasize that the degree of simplicity or complexity in a tune’s construction is not necessarily a good barometer of whether the number is easily swingable. As I have previously remarked in these pages, tunes like “Tiger Rag,” “That’s A’Plenty” and “Eccentric” are quite intricate pieces that have nevertheless become part of the standard repertoire for most Dixielanders. Con­versely, lots of pop tunes from the twenties of fairly common construction, including quite a few hits, don’t seem to be particularly receptive vehicles for Dixie­land units. Turk was one of Dixieland’s finest composers. He had a remarkable gift for melody, his sizeable body of originals being abundantly decorated with singable lines that linger in the mind. He had the knack for finding distinctive harmonies for these melodies, harmonies that seem strange at first but are very comfortable when you get used to them. Thus, “Duff Campbell’s Revenge,” a first-rate selection with a truly daunting chord pattern, isn’t something that you can just “ear in” after a couple of run-throughs. However, most bands who’ve done the work to get it under control haven’t had any particular trouble getting it to swing — and that includes a couple of Chicago-styled combos (bands whose normal approach to Dixieland is at the opposite end of the jazz spectrum from Turk’s): Eddie Condon’s aggregation and Parke Frankenfield’s Swing ‘N Dixie. In sum, keep on trying to stretch your abilities and those of your sidemen. Keep rehearsing those toughies that have resisted you so far, but which you’re sure can be conquered (and have the perception to forget those that can’t). However, when you get out in front of us, and you want to give us our best blast for the buck jazz-wise, make sure your reach stays within your grasp. If you do, when you look around, I’ll bet you’ll be able to locate fairly easily more than enough tunes that you can swing with heat and thereby get us goin’. Believe me, we’ll come back for more.